Austin College’s new telescope opens new vistas for students and the community. The crowning jewel of the new IDEA Center is the observatory, which will house a state-of-the-art custom-built telescope. The 24-inch telescope will be on par with the research telescopes at larger institutions, and will have an ultra-sensitive, high-resolution camera to capture digital images of the moon, planets, and deep space as well as a high-resolution spectrometer to measure light intensity at several wavelengths. With this new equipment, students will be able to monitor the weather on Mars, track near-Earth asteroids, and possibly even measure the spin of other galaxies in deep space. “There’s a possibility student researchers will be able to discover new asteroids, or to detect comet impacts on Jupiter,” said David Baker, associate professor of physics. 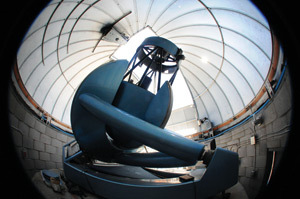 In addition to providing top-notch research opportunities for science majors—“once a student is trained on the telescope, they’ll get free reign with it,” Baker said—the observatory will support a new course offering. An astronomy course for non-majors will offer hands-on work with the telescope, and, students even may be able to build their own (small) telescopes. “They’ll learn not just about the night sky, but about the equipment and the technology that is used to observe the universe,” Baker said. The observatory also will host “star parties” for the community and secondary school students. A room set aside on the third floor of the IDEA Center will allow groups to see images from the telescope on a large screen, guided by physics students. Having this telescope will “better prepare our students to become astrophysicists,” said Baker. He hopes it also makes Austin College the destination for future scientists, and sets the College apart for high quality undergraduate astronomical research.